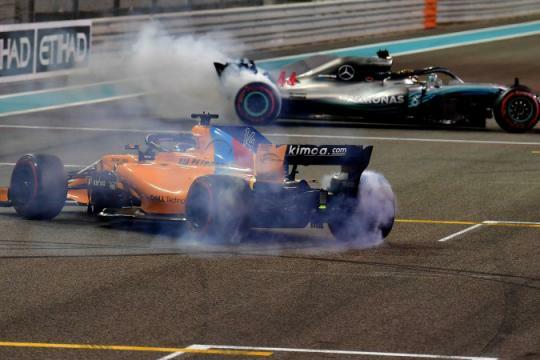 Five-time world champion Lewis Hamilton signed off on the Formula One season in style and a cloud of tire smoke on Sunday after a pole-to-flag victory in Abu Dhabi, his 11th win of the campaign. Ferrari's overall runner-up Sebastian Vettel finished second, and also set the fastest lap, with Red Bull's Max Verstappen third in a race that also saw a rare sprinkling of desert rain. 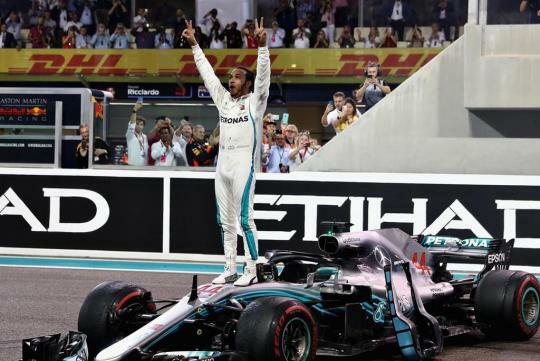 "I am so happy right now," said Hamilton after Hollywood actor Will Smith brought down the checkered flag at the floodlit Yas Marina circuit on the Mercedes driver's 73rd career win. The 33-year-old Briton, who has won 51 of the 100 races in the V6 turbo hybrid era, became the first driver to score more than 400 points in a single season with a final tally of 408. Hamilton's victory also left him 18 wins away from Michael Schumacher's all-time record of 91 and he celebrated on the podium by stripping down to his waist and showing off his tattooed torso as the fizz was sprayed. Two-time world champion Fernando Alonso, in his farewell race with McLaren, had hoped to sign off in the points but finished 11th and with his final tally at 1,899. With both championships already won, Hamilton taking his in Mexico with two races to spare and Mercedes sealing their fifth successive constructors' and drivers' double in Brazil, Sunday's focus was on the race and those moving on, particularly Alonso. Hamilton, Vettel and the Spaniard – three great champions – spun their cars in a cloud of smoke at the end of their slowing down lap, before stepping out for hugs and words of mutual respect. "Fernando is a true legend. It's been a privilege to race when he is racing," Hamilton said. "The sport will miss him and I will miss him from the sport." Hamilton's teammate and 2017 race winner Valtteri Bottas was fifth, after starting on the front row, and ended the season winless and fifth overall. "It's been a mentally pretty tough year so I need a break," said the Finn. Compatriot Kimi Raikkonen, the 2007 world champion, retired seven laps into his final race with Ferrari as his car cruised to a halt on the pit straight, triggering a virtual safety car and Hamilton's early stop. The 39-year-old, joining Sauber next season, still ended third overall in the championship, two points ahead of Verstappen. McLaren-bound Carlos Sainz finished sixth in his last race for Renault ahead of Sauber's Charles Leclerc, who now heads to Ferrari, and Force India's Sergio Perez. The Haas pairing of Romain Grosjean and Kevin Magnussen took ninth and 10th. The safety car was deployed at the end of the opening lap when Nico Hulkenberg's Renault was sent barrel-rolling several times before coming to rest upside down on the tire wall after a collision with Romain Grosjean's Haas. All wheel drive for Formula One?